It used to be you could put up a blog, create a white paper or come up with a slick infographic, and claim you’re doing content marketing. Oh, for the easy days. Now, in our multi-channel, hyper-social, personalized landscape, content marketing has gotten a lot more complex and far more strategic. And as customers have seized more control of the conversation -- and traditional advertising continues to lose its clout -- content marketing has become an undebatable marketing tool for both lead generation and brand awareness. But given how essential it has become, customers are being carpet-bombed with content. How do you rise above the noise? What channels are essential? How do you maintain relevance? What forms of content are most effective? And how do they fit into a comprehensive marketing plan, not to mention the customer journey at all its junctures? 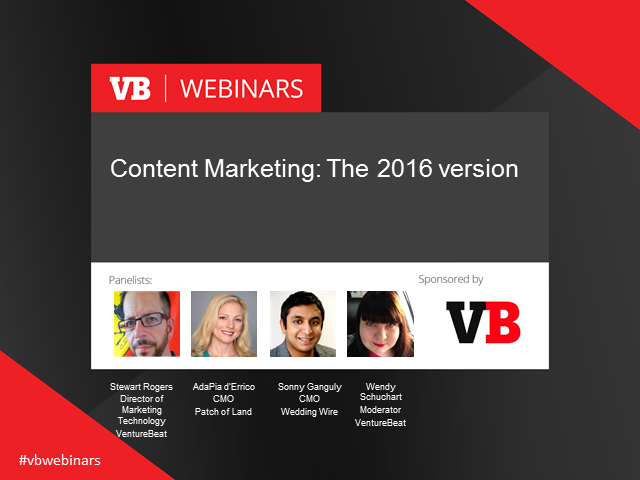 Join our panel of content marketing experts and VB’s Director of Marketing Technology research to learn essentials no marketer should be without as they head further into 2016. • Determine the ROI of content marketing, plus the tools and metrics to use.